Manny to the Rangers: Happy Birthday, America! Jobu, Manny Ramirez and the Texas Rangers are here to wish America a happy birthday. To me, the Fourth of July is all about how our forefathers fought to free this country from the grimy hands and gnarled gum lines of the British empire. OK so, technically, I’m not an American, and Uruguayan Independence Day is August 25th, but America is my home and I don’t need to read the Big Book of British Smiles to know that I’m grateful that George Washington mopped the floor with some redcoats back in 1776. ‘Murrica rules! OK, Is everyone offended enough? Good. Let’s get down to business. When I think of the Fourth of July, I think of fireworks, grills, beers and fun. Actually, this year I’ll be helping my dad put in new floors and cabinets in his kitchen (much less fun than when I helped him smash up the old tile floor, btw). But after that, I’ll be celebrating America like everyone else, because that’s what I do. I love America so much, in fact, that I wish I could give back to my adopted homeland for all the great things it has provided for me and my family. Unfortunately, I am just a lone Uruguayan and cannot give much. Thankfully, the Texas Rangers have given America enough for all of us who wish we could give too. 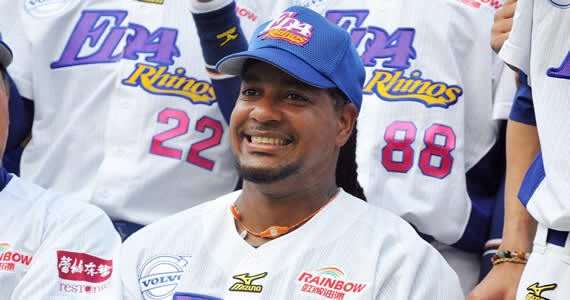 Yesterday, they announced that Manny Ramirez had signed a minor league deal with the franchise. That’s right, America. Manny’s back! We all remember Manny’s “retirement” from baseball due to an impending 100-game PED suspension back in 2011. After a year off, Manny tried to come back with the A’s and somehow got 50 games shaved off his suspension, but couldn’t make the big league club after struggling in AAA. After 17 games, he was released. It seemed that Manny’s major league career was all but done. An era had come to its sad end. But was all really lost in Mannywood? Manny began 2013 not in America, or his native Dominican Republic, but in the East, playing baseball for the Taiwanese League’s EDA Rhinos. He provided those fans with many amazing moments, including the “Ex-Girlfriend Home Run Call” above (this link will explain what I’m talking about), and actually hit very well in Taiwan, leading the league in hitting, home runs, RBI and walks during his short stint there. A couple of weeks ago, he decided to “retire” from the Taiwanese leagues. It was unclear if he was just ready to come home, done with baseball all together or looking for one more chance at Major League glory. Today, we all got our answer. I’m not certain Manny can even make it back to the bigs for Texas, but it’s nice to see him trying again. Thank you Texas Rangers. You’ve done America a solid. Welcome back, Manny.